An international relocation to London is inevitably going to entail challenges for anyone making the move. If you’ve been following my recent series, however, I’ve been specifically addressing the needs of accompanying spouses (also known as trailing spouses—yes, there’s actual lingo out there to describe us in the global mobility industry). What’s key to understand, though, is that while the accompanying spouse or partner is likely the one to take the brunt of the relocation stress, it takes two to tango, as they say. Both partners involved are going to be affected by the phenomenon I outlined in Part 2 and Part 3—that is, Maslow’s hierarchy of needs getting whittled down, layer by layer. Now bear in mind that I am not a psychologist, social worker, life coach, or of any other profession licensed to spew couples counseling advice. I am an accompanying spouse, however, so I speak with that authority as far as my own personal experience is concerned (which I explained in Part 3). Every situation is different. I can’t pretend to understand all factors involved in your relationship and general circumstances, but I do have some important advice to share that addresses the common scenarios I’ve observed across assorted London expat couples, and I’ll do so coming from both points of view of the employed and trailing spouse. So. If you haven’t moved to London yet, you’re in a really good position to start having some serious pre-relocation talks. You probably already have concerning a number of matters, but make sure you specifically outline expectations of what one another’s role will be post-relocation. Have you budgeted for your upcoming cost of living? If so, will both spouses/partners need to work, or will the one whose job is relocating you to London bring in sufficient income? If you’re not working now at home, can you still not work in London? If you have a job at home, will you have to have one in London? If so, does it need to be full-time or part-time? Do you want to continue along your career track at the same level/pay-scale, or are you open to trying something different, maybe just something fun you’ve always been interested in trying? If you aren’t going to seek employment in London or will do so on a part-time basis, are you going to take primary responsibility for domestic duties (i.e., grocery shopping, laundry, housecleaning, etc. ), or will you two divide them? If you are going to seek employment in London, when will you start looking for work? Before or after the move? If after, how soon after? Do you require time to get settled in first? It is imperative to have these and related questions sorted right away—ideally, before your move. Maybe even get it in writing. 😉 Kidding about that, and yet not really…because it’s not all too uncommon for one partner or another to renege on promises. The reality might be very different than what you’d anticipated, so what sounded reasonable before isn’t seeming so later. In a case like that, it could be vital to adjust your expectations to the actual situation—my husband and I, for example, moved to London the very week that the economy tanked in 2008, crushing our US investments and diminishing the USD value of my husband’s GBP salary. Needless to say, that forced us to reevaluate our finances and, consequently, what monetary contributions I as the trailing spouse would indeed need to make while living here in London. 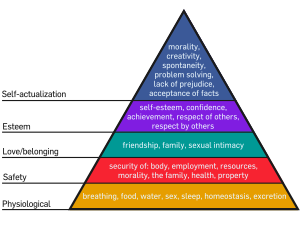 Granted, I had already set expectations before the move that I was going to work, so the stress in that situation came more from the job-hunt not being quite I’d expected and the pressure to bring in money something that did not help me rebuild my Maslow pyramid at all. Which will lead me into Part 5 of this ever-expanding series, concerning emotional support between spouses/partners following a relocation to London.